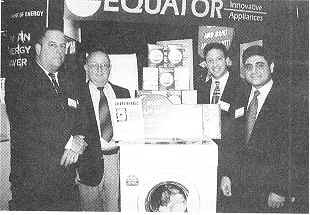 HOUSTON, TX – The Equator Corporation has introduced the Equator Clothes-Processor EZ3600 CEE, a washer-dryer combo which meets Energy Star and CEE standards. Equator will expand its laundry line next month with the addition of washer/ dryer combination model EZ3600CEE, a front-loading unit that meets Energy Star and Consortium Of Energy Effciency standards. I loved the timesaving appliances featured in your cookbook section [March 8]. Left to Right: Jack Sharrow of Equator Corporation, Jenna Smith and Sue Hill of Seattle Public Utilities, Atul Vir, President of Equator Corporation, and John Mitchell of Tri-State. 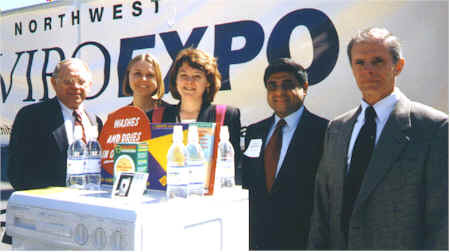 The Mayor of Seattle, Mr. Paul Schell, at the launch of the Northwest Enviro-Expo on Earth Day April 22, 1999. Seattle Public Utilities offered a rebate of $200 for every Equator EZ 3600 CEE Combo Washer Dryer purchased during the Expo. The 3600 CEE is specifically designed to use less water, less energy and less detergent. Perfect for condos and townhomes, the Clothes Processor washes and dries your laundry in a single33½x23½x23-inch unit. Plus, ventless electric operation means you can tuck it under a counter or inside a cabinet. 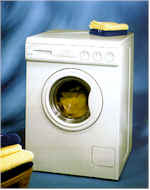 The EZ 3600 is a combination washer and dryer that occupies 70 percent less space than separate units. 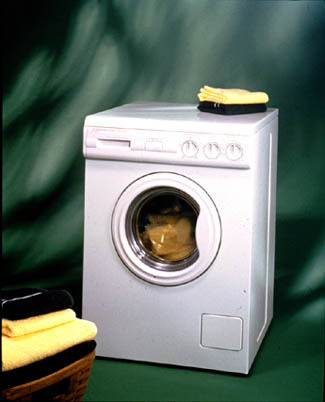 The manufacturer, Equator Corp., says that not having to transfer wet clothes from a washer to a dryer also saves time. Houston, TX: Equator Corporation introduces the Equator Mini-Maid, a compact dishwasher designed to be placed on a kitchen counter. The space saving design saves you time and energy as well, and uses less detergent and water than full-size dishwashers.